Growing up in Oklahoma City, I didn’t have a childhood dream of becoming an author, but I did love to read – a lot! From reading the backs of cereal boxes to books from the local library, I developed an appreciation for the power and impact of the written word. However, I didn’t write my first book until years later. After working for many years as an Administrator in a large multi-specialty medical clinic, I returned to school and began a second career. I earned a Master’s Degree in Counseling and am licensed in the state of Colorado. Since then I have spent many hours encouraging, motivating, challenging and inspiring individuals, couples and families in my private practice. My goal was to create an easy-to-read, and more importantly, an easy-to-implement book to truly change lives. This book is designed to help people become free from such issues as negative family patterns or a mistaken belief that pleasing others is a spiritual gift. I still enjoy reading, and my husband Jerry and I also like to travel and get away to the mountains to enjoy one of my favorite hobbies, photography. You may think that setting boundaries is easy, but in actuality it can be challenging. In reading Yes! I Said No! How to Set Healthy Boundaries and Increase Your Self-Esteem by Barbra E. Russell, you will learn that setting these boundaries, which in the past once posed a problem for all parties involved, can now be healthy and set great limitations. The art of “No” is an art that we all must practice and perfect each day. Saying no to your loved one or others that can impact your life is not an easy feat, but if you get a copy of Yes! I Said No! How to Set Healthy Boundaries and Increase Your Self-Esteem by Barbra E. Russell, you will learn how to perfect your no. What a way to start my day! A 5-star review is better than starting my day with my favorite cup of coffee!! :) I'm looking forward to this book helping people all around the world. As another reader stated: "I've read multiple boundaries books through the years and although each one was helpful, none of them were packed with as much practical application as this book, "Yes, I Said No!". I read it from cover to cover on a business flight between Nashville and Denver and began putting it into practice immediately. Over the next few months, everyone noticed a difference in my life and I realized I was happier and more content than I had ever been. Now I know my emotional cues that let me know when I need to set a boundary! It is so empowering! As my confidence has grown, many new opportunities keep opening up for me, taking me to higher levels in my career. All of my relationships are getting healthier. I am in awe of all the good things that are coming into my life as I have stopped trying to please everyone and learning when to say "No!" 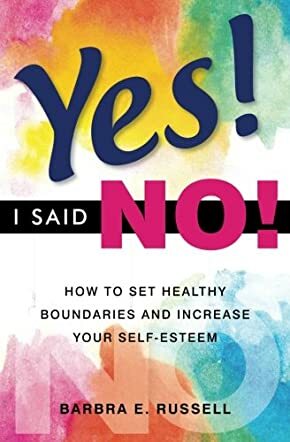 I've read multiple boundaries books through the years and although each one was helpful, none of them were packed with as much practical application as this book, "Yes, I Said No!". I read it from cover to cover on a business flight between Nashville and Denver and began putting it into practice immediately. Over the next few months, everyone noticed a difference in my life and I realized I was happier and more content than I had ever been. Now I know my emotional cues that let me know when I need to set a boundary! It is so empowering! As my confidence has grown, many new opportunities keep opening up for me, taking me to higher levels in my career. All of my relationships are getting healthier. I am in awe of all the good things that are coming into my life as I have stopped trying to please everyone and learning when to say "No!" This book has been very helpful for me. I always had the fear of saying no. I felt guilty. I was afraid of hurting others feeling, but when I had the opportunity to say no when I needed to it felt good. Good reading and very inspiring. A very well-written book packed with very useful information and excellent examples of how to set proper boundaries. I Highly recommend it! A great "how to" book with practical, do-able advice! Very informative, but also very engaging. My interest was captured from the very first and did not wane until I finished reading in one sitting. Who has not dealt with the challenges of an overloaded schedule, or demands from family and friends; ending up feeling frustrated? Big changes in behavior can feel daunting, but with the step-by-step instruction, the reader is left feeling, "I can do this!" Containing bulleted lists and an easy-reading format "Yes! I Said No!" becomes a handy reference to navigate these very liberating changes on a personal level. I'm sure the most effective way to utilize this book is through Barbra's own "Highly Effective Woman" conferences providing interaction with the author and elaboration on the material presented. However, utilizing the book for seminars and small groups would also be an engaging study. I'd refer this book to anyone who is looking for a quick read on how to take back their personal power by saying NO and putting boundaries in place. You can read it within a couple days, and implement it immediately. Personally, I meet people who never say NO and you see the cost to their personal health and well being. Then they get resentful or avoidant. If you suffer from "waiving the resentment red flag" as Barbara suggests or whimp out when you need to hold your own, this quick book will give you ideas on how to say no. It provides tools and answers to the yes man or woman dilemma. Barbra E. Russell follows the advice she delivers through this very powerful resource. I have known Barbra for years and have witnessed first- hand how her advice has saved and transformed lives in the Denver as well as the international community! Barbra is as real, genuine, and knowledgeable as it gets. This is a great read, but makes for a fantastic application of boundaries to help us find out way through the storms and seasons of life! Anyone could benefit from the life lessons and wise counsel that can only be found in, "Yes! I Said, No!" An excellent read, determined by my finishing it in one sitting! Practical how-to advice that when put into practice, will help the reader become healthier and challenge them to create a new normal. I enjoyed the flow of this book and have already seen positive outcomes from setting some of the boundaries as suggested. Buy it! You will not be disappointed.